The Australian Fossil Mammal Sites Riversleigh and the Naracoorte are a superb illustration of the key stages of the isolated evolution of Australia's unique fauna. Riversleigh is located in in North West Queensland and has fossil remains of ancient mammals, birds and reptiles of Oligocene and Miocene age. Thirty-five fossil bat species have been identified at the site, which is the richest in the world. The skull and nearly complete dentition of a fifteen million-year-old monotreme, Obdurodon dicksoni, provide a window into the evolution of this characteristically Australian group. 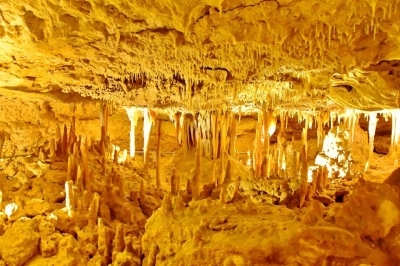 The Naracoorte Caves are located in the south-east of South Australia. The caves are often not far below ground, and holes open up creating traps for the unwary. This is the source of the remarkable collection of fossils. Mammals and other land creatures have fallen into open caves and been unable to escape. The fossil record has been preserved in strata formed from eroded topsoil washed and blown in. In some places, the fossil-bearing silt is up to 20 metres thick. I visited the southern half of this serial nomination: Naracoorte Caves. It is located 10km south of the town of Naracoorte, some 5 hours drive from Melbourne. Quite a remote location – but it does see its fair share of visitors. There were about 40 other cars in the parking lot when I arrived there on a weekday afternoon. Be aware: the caves are located in the state of South Australia, which has a half an hour time difference with eastern states like Victoria (it’s half an hour earlier here than in Melbourne). Visits to the most interesting caves are by guided tours only. They conduct several of them during the day. Most popular is the Bat tour, where you can watch the large bat population. However, I had arrived just in time to join the Fossil tour. This takes you into Victoria Fossil Cave, the one cave that has earned Naracoorte its WH status. This Cave is 1.5 kms away from the Visitor Centre. It’s a limestone cave of about 500,000 years old. It has a variety of dripstone features, and it holds the first fossil bed found at Naracoorte. Later on they have discovered more of them, in other caves too. The animals got trapped in here after they had fallen through holes in the surface. The fossil bed is as big as an Olympic swimming pool. It still has a lot of bones in it. The skeletons of two of the most impressive species found here have been put together. One is from a Tasmanian Tiger, the other from a planteating kangooroo. After the tour I went back to visit the Wonambi Fossil Centre at the entrance of the park. Here they have “reconstructed” some of the larger mammals into complete and moving beasts. It’s all a bit childish. It does however give you a good look at the largest mammal found here: the buffalo-like Diprotodon. I visited this WHS in January 2018, focusing on South Australia's only WHS - Naracoorte Caves National Park. I had prebooked online (32 dollars) to secure a place for the Victoria Fossil Cave guided tour at 14:15 (it takes roughly 1 hr). If there are any palaeontologist geeks who would like to invest more time (and money!) there's also a WH tour to Victoria Fossil Cave and Blanche Cave to also visit research areas not usually seen by the general public. After a long drive from the Great Ocean Road (at least you 'gain' 45 minutes if driving from the state of Victoria), we parked at the Wonambi Fossil Centre. Here we collected our tickets, and got a brief visual introduction of some fossils and how the megafauna must have looked like by doing the self-guided walk through a simulated forest and swampland geared mostly at entertaining children. There are several information boards displaying inscription on the WH list just next to the entrance and the only cafe and toilet facilities available around. We drove again to the Victoria Fossil Cave (some 2-3km away) to meet our guide. Even though the number of people visiting the cave at any one time is capped to 25, it felt a bit too crowded at times. The temperature inside the cave is a constant 17 degrees Celsius so it's not too bad and a welcome change from the outside heat. 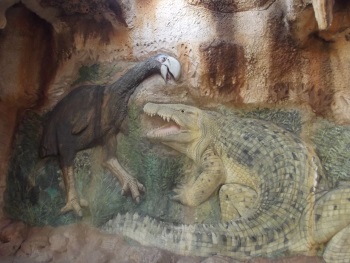 Apart from a few rather ordinary cave features, the highlight of the cave is the fossil deposit (which is still being excavated) behind the two replica fossils with a spotlight in front of them to amplify their shadow (photo). The fossils of the Naracoorte caves accumulated over the last 500,000 years, a period of the world's history marked by a series of ice ages. The fossils are very well preserved in sediment deposits within the caves. They represent a large number of vertebrate species and provide an opportunity to study the impact of climate change on biodiversity before and after Australia was populated. Each deposit can potentially give a snapshot of life during the Pleistocene epoch as well as provide evidence for changes in climate and vegetation. 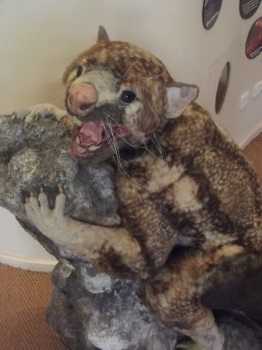 Whereas Riversleigh provides a view of the ancestors of the Australian fauna, Naracoorte's fossil record spans a period when their descendants became extinct. Both sites were inscribed on the WH list as outstanding examples representing major changes of the world's evolutionary history and as outstanding examples representing significant ongoing ecological and biological evolution. The largest fossil deposit was discovered in the Victoria Fossil Cave in 1969 and further exploration has led to more fossil areas being discovered within the cave, the most recent being in 2000. It is believed that most of the megafauna found here ended up in this dark pit because they fell incidentally through a rather small opening in the ceiling of the cave. 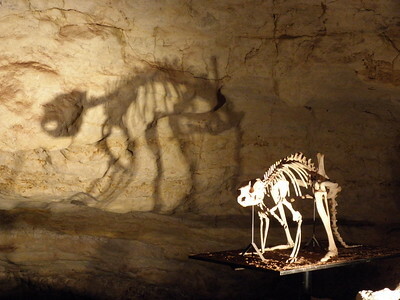 Of the several species of megafauna fossils found here, the most important were the large rainbow serpent, Wonambi naracoortensis, believed to have inhabited the dark cave and which preyed upon the unfortunate mammals which fell in the cave, and the Marsupial Lion, Thylacoleo carnifex, which had a very peculiar jaw bone and human-like fingers. Similar to most of reviewers, I only visited Naracoorte component of this World Heritage Site as part of my Great Ocean Road trip from Melbourne to Adelaide. I chose Penola, a lovely small town with fine food and nice red wine of the well-known vineyards of Coonawara as my base to visit this fossil caves national park. Before the visit it is highly recommended to check the website of the national park for tour schedule and buy the limited ticket, I saw many tourists came without this preparation and found no tour available. I arrived the tourist center 1 hour before my booked tour to register. 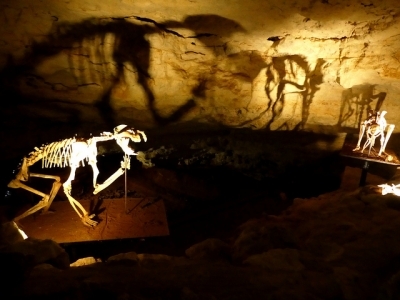 The biggest attraction on the ground level is the big cute statue of Diprotodon, an ancestor of wombat and Koala bear. From the tourist center, I had to drive to the entrance of Victoria cave and wait for the ranger with the less of almost 30 tourists. The tour could easily divide into 2 parts, the normal cave tour with lovely stalactites and stalagmites, and the fossil bed tour. I was quite surprise to see that actually the cave was quite beautiful better than my original idea. Maybe originally the caves have pretty low ceiling so the formation of dripstones here are easier. It was quite fascinating to see how much earth they had to dig out in order to make passageway for tourists without crawling the low ceiling. Too bad that the quality of dripstone could not compare with other famous World Heritage Site caves, but it was lovely and the fossil was the real reason to come here. The fossil part was even more surprising, after small caves, I entered a reasonably big cavern with many chairs similar to small classroom. Here the ranger showed us the fossil bed and many fossil sample. The stories of how ancient animals trapped underground and struggled to survive were quite sad. The ranger also gave us a chance to touch those fossils which was an amazing experience, and jokingly that the fossils here were enormous and they already had too many specimens that cannot find space to keep so that if anyone asked for a souvenir he may ask his boss for approval! I spent about 3.5 hours in this national park, the visit experience was nice and very educational, it was well plan for all ages, which was quite contrast to US that seem to focus on children, and in my opinion better than other fossil sites I have been. The site is not a must visit for Australia but it is a great stop between Melbourne and Adelaide along the Great Ocean Road for everyone. This year I visited the Northern part of this WHS : Riversleigh, Qld. The site is scattered over a large area, but section D is where some important finds have been made. The finds however are not here, but have removed for study and processing to the Outback on Isa Museum in Mount Isa. They are readily accessible in the Riversleigh section, soaking in acid to remove some of the encasing limestone. This work is only in its infancy, and much is left to be discovered. Some of the Premier Stateliner buses travelling between Adelaide and Mount Gambier stop at the township of Naracoorte. Others travel along the coast. The caves are some 14 kms distant from the township, but I managed to enlist the assistance of the Visitor Information office to arrange transport. My visit coincided with tours of the Alexandra Cave, as well as the Wonambi cave full of mock-ups of prehistoric animals based on the skeletons found at the site. When driving from Southern Australia's capital Adelaide direction the Great Ocean Road, the Naracoorte Caves are only a small detour, but surely worth the gazoline.It puts you back into times half a million years ago;you can visit the various caves on guided tours that leave on certain times during the day.Its all on their website.We opted for the Victoria Fossil Cave and were not disappointed.Not only were there beautiful rock formations, stalacmites etc., but our guide/palaeontologist was very knowledgeable. We were told that inside the caves tens of thousand of specimens representing about 93 vertebrate animals have been collected.Ranging from the Tasmanian Devil to wallabies, extinct mammals and even turtles. Most of them fell down into holes of the cave's ceilings and could not escape.It is Australia's largest fossil deposit in terms of volume in a single site. I visited Naracoorte in 2002. The stalagmites and stalagtites were so spectacular and delicate. I enjoyed learning about prehistoric animals such as the Short Faced Leaf Eating kangaroo! Reduced from broader TWHS: Originally a third fossil site, Murgon, was part of this serial nomination. It was rated of a lesser quality than the other two, and omitted from the definitive nomination.